All kinds of bulbs and corms normally increase in number naturally. Thus a double-nosed daffodil will produce at least two bulbs which may in turn have more than one nose. Gladiolus corms frequently produce large numbers of cormels around the new corm. If left in the soil in a frost-free place these would quickly make flowering size corms. If the corm is lifted the cormels can be detached and grown on in a frame. Some bulbs make many small bulbs instead of one or two flowering size ones. Tulips need especially good feeding to pre­vent this happening too frequently. Some lilies, e.g. Lilium tigrinum, make bulbils in the axils of the stem leaves. These can be collected and grown on when ready to drop to the earth. Sparaxis make small bulb-like cormels at the lower leaf nodes. These can be collected and grown on. Most lilies can be increased by detaching the bulb scales and pushing them, bottom edge down into a pan of sand and peatmoss; in a close propagating frame tiny bulbs will form on the lower edges. Tubers are not so easy to increase as bulbs and corms and if the tuber is not of a shape that allows it to be cut into two or more pieces, each with a growth bud as well as some stored food it may not be possible to increase the plant other than by seed. 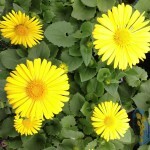 Some are regularly grown from seed, e.g. 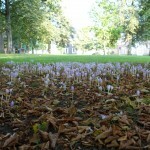 cyclamen, others also from cuttings during the early stages of growth, e.g. dahlias, smithianas. When buying tubers it is sense to buy small ones which have only recently been grown from seed, as these will have a longer life. Some bulbs can be grown to flower­ing size from seed in little over a year, but they are the exceptions. Most of the South African corms and many lilies flower in the third year, but tulips and daffodils may take as long as seven years to produce a flowering size bulb from seed.